Daisy Sheldon Embroidery is a bespoke embroidery and design studio, based in Cheltenham in the Cotswolds. 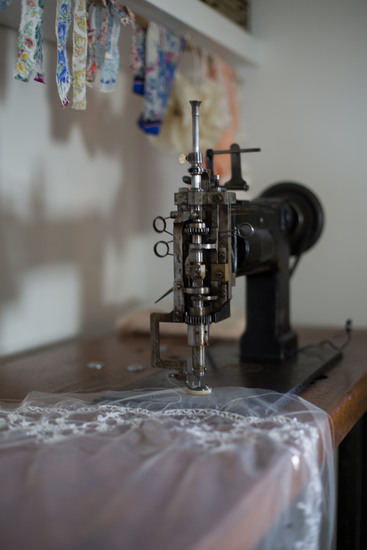 Daisy offer's a bespoke embroidery service, working with clients from concept to design and production for fashion, costume, bridal, lingerie and interiors. Daisy specialises in bridal and lingerie, creating beautiful and unique veils, working with brides on a one-to-one basis. Each wedding veil and lingerie set from the collection is lovingly handmade to the specific requirements of the bride. Daisy uses specialist embroidery machines, including the Cornely, a beautiful 1920's machine which creates a decorative chain stitch and the Irish, a freehand embroidery machine which ‘draws’ with stitch, as well as embellishing with hand stitching and beading. Daisy also offers a completely bespoke service to create a unique wedding veil.